I didn’t dress up or carve any jack-o-lanterns this year, but I did enjoy plenty of pumpkin. 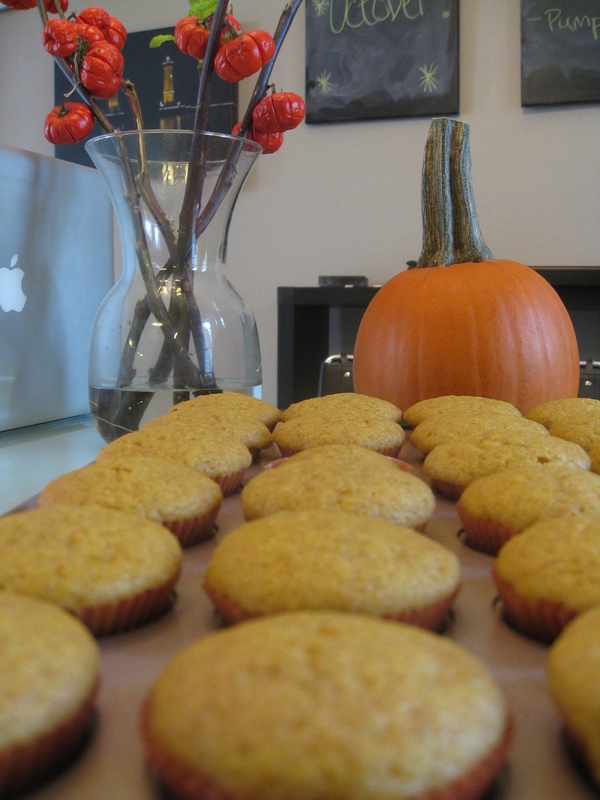 I made these pumpkin cupcakes for school today and also because yesterday was a beautiful Sunday! 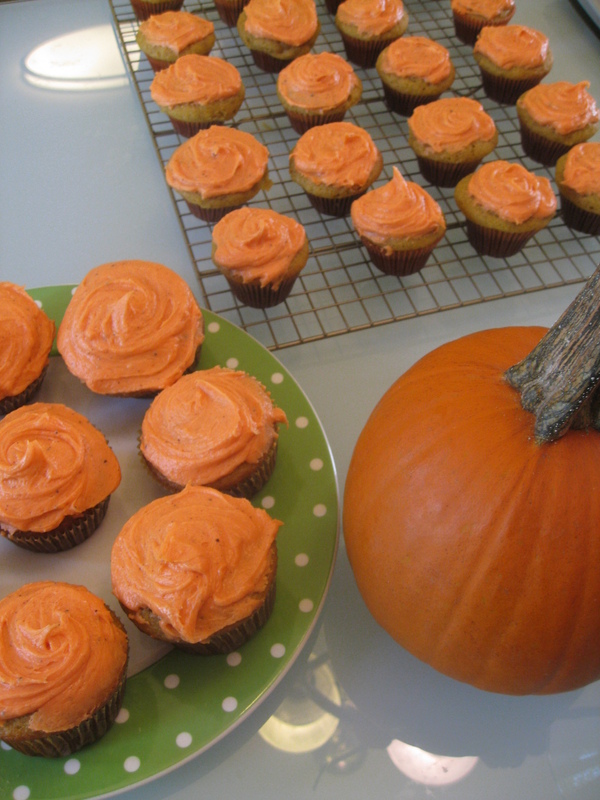 Most of the blogs I have seen used browned butter icing, so I thought I would use the same. 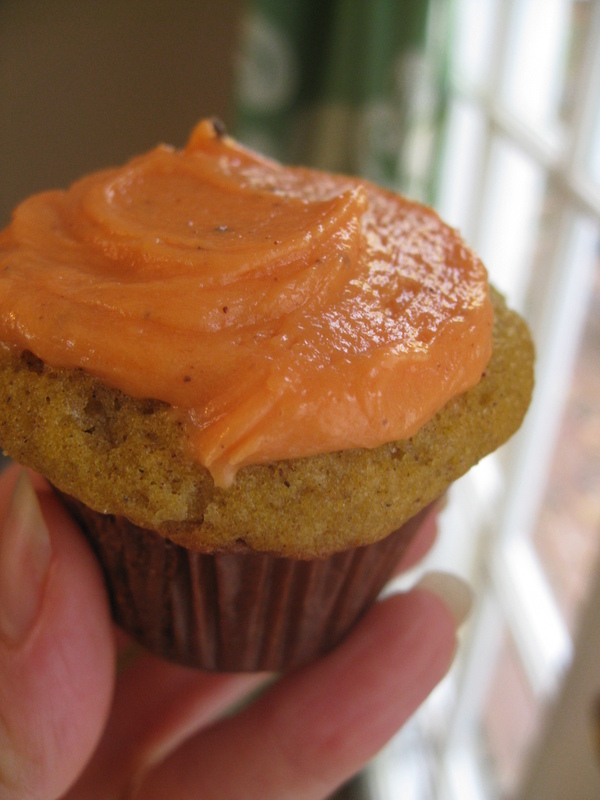 It adds a nice twist and an extra flavor to the pumpkin cupcake. This recipe is adapted from a pumpkin square recipe that my friend’s mom gave me (thanks to Becca and her mom!). I’m glad I got plenty of pumpkins before the holiday snuck up because apparently the grocery stores are all out! Trick-or-treaters: I bought pumpkin shaped reeses, so feel free to come by my house! In a mixing bowl, beat together eggs, sugar, oil and pumpkin until light and fluffy. Stir together flour, baking powder, cinnamon, salt and baking soda. Add to pumpkin mixture and mix thoroughly. Add batter to paper lined cupcake pans. Bake for 15-20 minutes, depending on the size you are baking. Brown butter in a skillet. The butter will give off a nutty aroma and start to bubble and brown. Allow butter to cool. Beat together cream cheese and butter. Mix in sugar and vanilla. 1) I oppose leaves changing so early. 2) I just realized that the cherry brownie is photographed on the cake plate from me.